● Order products for $85 or more to receive free shipping. Restrictions apply, so make sure you read carefully. This offer might be subject to change. ● Shop the Hot Deals section to find clearance items at 70%, overstock products at 25% and specials at 10% off. ● 5-15% off coupons are common, as well as reduction codes for specific products and free shipping. Sign up for the coupon newsletter to receive codes for discounts. 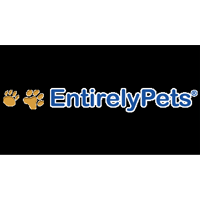 The Entirely Pets website is a clearinghouse of sorts for everything pet related. Visitors are going to be able to purchase dog supplies, cat supplies, as well as supplies for exotic pets and fish directly from this website. All of the major dog and cat food brands are carried by this online site, with a lot of toys, grooming supplies, and medications and supplements are available as well. Customers will pay a flat shipping rate on all orders under $85, with every order headed to addresses in the continental United States valued at more than $85 shipping free of charge. For most up to date offers check out Entirely Pets on Facebook and Twitter or contact Entirely Pets Support for any questions.